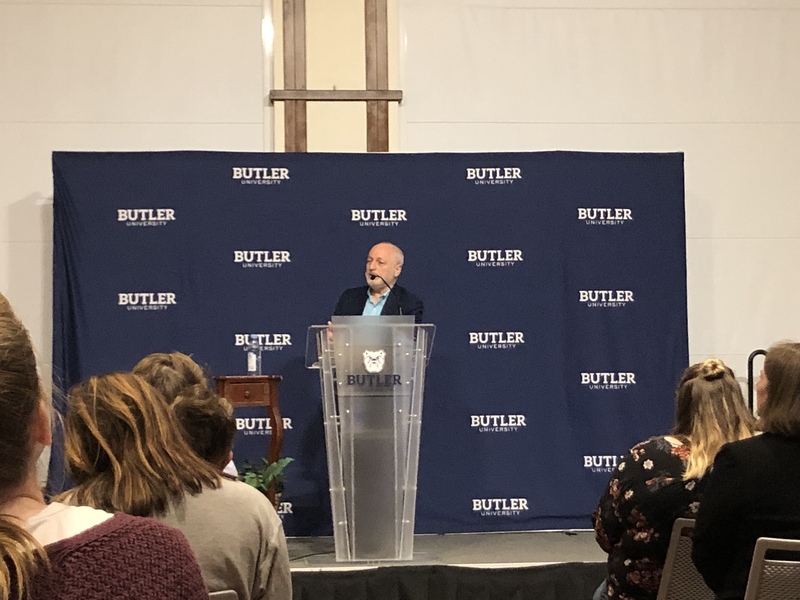 André Aciman was the last speaker for the 2018-19 Visiting Writers Series. Photo by Sorell Grow. André Aciman spoke and read from his works as the final guest author in the 2018-19 Viviane S. Delbrook Visiting Writers Series in the Reilly Room on April 16. Aciman is the author of the 2007 critically-acclaimed novel “Call Me By Your Name,” which won the Lambda Literary Award for Gay Fiction in 2007. The book was later adapted into a film directed by Luca Guadagnino and starring Armie Hammer and Timothée Chalamet in 2017. The film won the Academy Award for Best Adapted Screenplay in 2018. “Call Me By Your Name,” set in the Italian countryside during a summer in the 1980s, chronicles the summer romance between a 17-year-old American-Italian boy named Elio Perlman and a 24-year-old American doctoral student named Oliver. While the novel is considered a “coming of age” book, a term Aciman claims he hates, he said he has come to terms to with the coined label because that’s what everyone else calls it. “I’m known as this nostalgist, though I don’t have an iota of nostalgia in me,” Aciman said. Aciman was born in Alexandria, Egypt, and now lives in New York. In his spare time away from writing, Aciman teaches the history of literary theory at the Graduate Center of the City University of New York. “When you’re a writer, you cannot always be confused, but you can actually be aware of confusion as a locus, a place in the human soul,” Aciman said. Once he stepped behind the podium onstage, Aciman started off by telling sarcastic, self-deprecating jokes about his upbringing before he started reading from his books. After introducing himself, Aciman started off with reading a scene from “Call Me By Your Name,” when Elio confesses his love for Oliver. He spoke about his experience seeing the scene played out in real life by Chalamet and Hammer when he visited the set of the film. Aciman’s second and third readings were from his 2017 novel “Enigma Variations,” which is about a young boy who falls in love with his family’s carpenter. Francie Wilson, a first-year journalism major, attended the event because she saw the movie “Call Me By Your Name” and enjoyed it. Susan Cloe has lived in the Butler-Tarkington area for over 30 years and comes with her husband to many of the lectures on Butler’s campus offered to the public. While Cloe hadn’t seen the movie or read the book before coming to Aciman’s reading, she said she wants to do so now.